Route 28 in Pittsburgh was home to several bridges in need of infrastructure rehabilitation. Additionally, retaining walls were desired to hold back the existing soil. The project was built parallel to a creek and sits above the water, so the retaining walls had to be constructed to hold back the above-ground soil from pouring into the creek. The owner’s primary goal was to build fast and efficiently all of the areas at once, including bridge abutments, piers, and retaining walls. Doka worked from day one to guarantee to the customer that Doka can and will give the best and right formwork solutions for the project and followed up with exactly the committed engineering/consulting that was proposed. The time constraints and the site layout were both challenges that required close and constant communication with the customer. 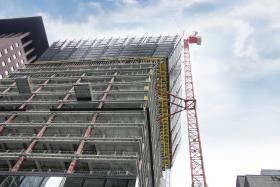 The variety of structures being repaired or built on this project required an array of formwork solutions. Retaining Wall 1 was a one-sided retaining wall that was tied to H-piles using 1 inch coil rod and 1 inch weld on angle tie brackets. It required custom Top50 forms that were assembled onsite and each custom steel piece were fabricated precisely in order to attach correctly to the forms. The custom parts were designed for reuse throughout each wall pour. Retaining Wall 2 was a two-sided wall that had unique haunches and a grooved finish. 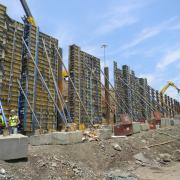 The Doka formwork used on this area was Framax with custom wood forms attached to form the haunch areas. This was a time-consuming dilemma that did affect construction, but with the Framax X-life plywood this proved to be a very effective design. There were three piers that were formed with Framax and each pier had to have a walking access platform. The platforms were designed with aluminum beams and 70 kip girder brackets that would support the forms and walking platform and were anchored to the pier columns. 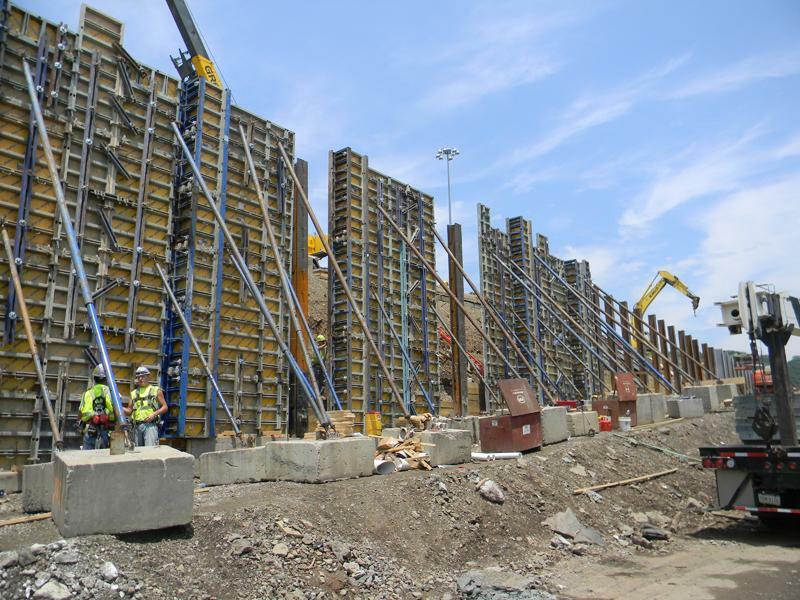 Massive bridge abutments were formed with Framax X-life panels. The heights of the abutments ranged from 26 feet to 38 feet and were over 5 feet wide. There were two big abutments and due to time constraints, both were constructed at the same time. A large amount of equipment was needed to form these abutments at the same time and Doka was able to provide everything at the time needed. Thank you for your interest - Fast Build Requires Constant Communication as Doka Formwork Works Multiple Projects Simultaneously. Thank you very much for your interest - Fast Build Requires Constant Communication as Doka Formwork Works Multiple Projects Simultaneously.